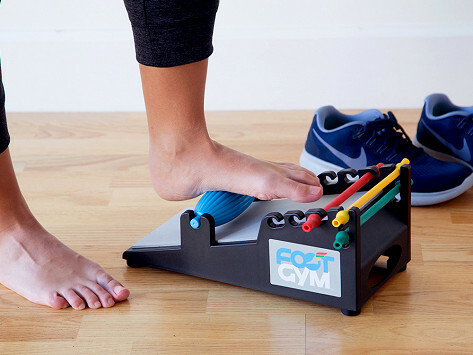 You can help alleviate plantar fasciitis, boost your balance and more with this all-in-one workout system for feet and ankles. The seven exercises and stretches will help improve strength and stability in this often-overlooked part of your body. The mini ramp-like station packs it all in—resistance training, stretching, and even massage. Dimensions: 13.5" x 7.5" x 6.0"
Thumbs up from my physical therapist! Feet and ankles are often overlooked during workouts, but strength in this area is the key to good balance, can help alleviate plantar fasciitis, and can have even more benefits for your overall health. This is where the Foot Gym steps in. Whether you’re an everyday runner, recovering from a foot injury, or just want to work on improving strength and stability, the gym packs in resistance training, stretching, and even massage to put feet and ankles through the paces. Co-Founder Ryan Kole wanted to heighten his vertical jump, so to train his feet, he curled his toes in a bucket of sand. Ryan knew he could create a better, sand-free way to exercise all the muscles in his feet. So he consulted physical therapists and trainers and started prototyping his one-stop, foot-and-ankle working system.